If you're looking for less hassles and headaches as your franchise system grows, a custom 'zeeStore® will make your life a lot easier! Our 'zeeStore® is a proven, turnkey single-sourced e-commerce platform that will carry YOUR logoed promotional merchandise, decorated apparel and marketing materials. It will be linked from your website or intranet requiring no internal programming from your IT staff. In fact, we'll replicate the 'look and feel' of your site to provide a seamless experience for your 'Zees. Your 'zeeStore® will allow you to consolidate and simplify the sourcing, buying, inventorying, and fulfillment of your merchandise into a dynamic, online Store accessible 24 hours/7days a week! Both you AND your 'zees will now be able to focus on growing revenues. Sell more Franchises. Discovery Day visitors will be impressed with the breadth of affordable sales and marketing materials AND the ease of use your 'zeeStore® will provide them for their business launch. Grow Existing Franchisees. 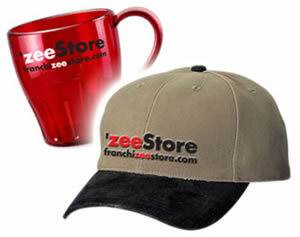 Your 'zeeStore® provides proven promotional merchandise and other materials designed to help your 'Zees grow their sales-and your royalties! Reduce Corporate Marketing Expenses. If you're providing these materials in-house with a hodgepodge of suppliers, an online 'zeeStore® consolidates this vital-but costly and time-consuming-function to outside experts who understand your system needs. Your staff will be freed to focus on more profitable endeavors--while logo and brand integrity is ensured. Who's going to build it for me? Your 'zeeStore® will be created, administered, and marketed by Palmer Promotions. We have 23 years of experience working with fast-growing global companies and franchisors. We'll take the time to learn and understand your unique needs. 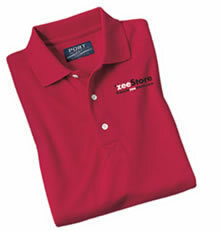 Coupled with our experience with other Zors, we'll create a custom 'zeeStore® that will be chock full of proven promotional merchandise, attractive apparel, and marketing materials designed to promote your brand and increase 'Zee sales. "...On a separate note since I have expressed displeasure towards a couple of the vendors we dealt with in the past, I would also like to pass along a positive one. Palmer promotions have been spectacular. Their response to orders is professional and lightning fast. They ship out faster than any vendor I have dealt with. Most similar companies seem to take a while for a shipment to leave the warehouse. They respond immediately. Palmer gets an A+ from me." What 'zeeStores® do you operate now? Sound good so far? Want to hear more?